I’ve decided to do a series of smaller-scale paintings to sell on Etsy, and this is the first. Thranduil of Mirkwood, or, as The Hobbit calls him, The Elvenking. Any good ideas for other characters to paint? I’d really love to do some more flowers… there’s still Blodeuwedd, but other “flowery” characters might be an idea too. Or anything else. Ideas? Those golden shadows in the background are beautiful! Regarding your request of suggestions for possible future works, I immediately thought of a few characters, but none of them are “flowery”: Melian (obviously), Radagast, and Sauron before he was Sauron (either as Mairon or as Annatar). Apparently I am in a “ancient powerful beings” mode and I didn’t even realize. Raaaaaaadagast!! Someone who needs a de-Jacksification s badly. Thank you!! That didn’t take long. He does look regal in his Autumn crown. First of all…The Elven King looks splendid! As a suggestion, what about Goldberry? And Sam Gamgee and family in their garden. Just a little bit of happiness. I love this portrait. I think it would be interesting to see a portrait of Legolas. That’d be rather leaves than fllowers but with the added challenge of capturing a family resemblance. Other than that: Galadriel Celeborn and Celebrian. That might also be rather treey that flowery but… With Galadriel it might b interesting to capture her development. From her youth to her life with Celeborn. God! This is great! :)) Simple pencil looks very bright and colorful! And do you scan your finished works or photograph? Aw, thank you! I fully understand about being a teacher AND an artist – and at times, the two can clash. Oh wow! I think this may be my new favorite of your works. The Elvenking has always fascinated me…this is stunning! I’d also love to see a non-Jackson rendering of Radagast. Goldberry would be lovely too. I’m wondering too if you have done much with the Rohirrim? Though not exactly flowery, I would love to see Eowyn and Faramir…Also, Prince Imrahil. He’s one of my favorites of Tolkien’s characters, but there doesn’t seem to be too much art relevant to the people of Dol Amroth. As for further “flowery” characters, Yavanna and Vána come to mind. Orome might also work. All the Hobbit ladies… and I’m definitely joining the demand for a more dignified, less batshit insane Radagast! This is lovely. I don’t hate the Jackson films, but man I could go on a tear about his treatment of the Mirkwood elves. 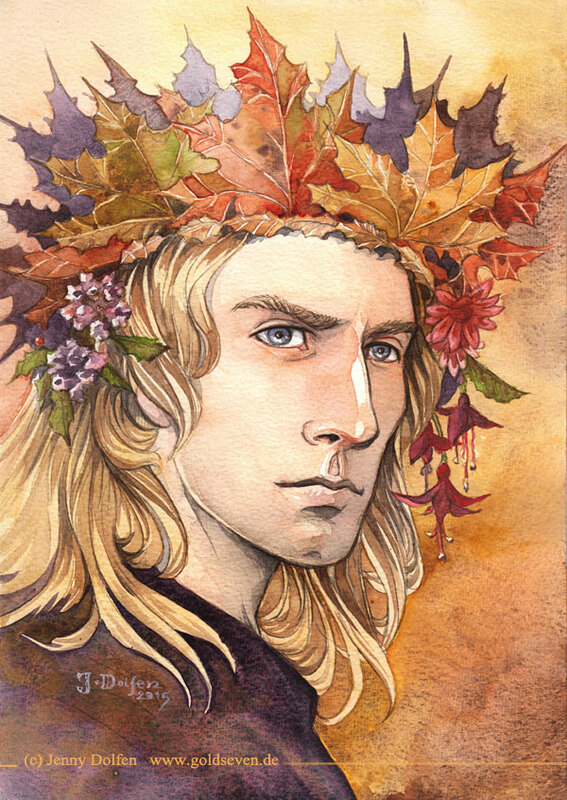 This is PRECISELY how I always imagined Thranduil myself. Lee Pace’s character is great, but he’s just a bit too majestic to be the king of a Woodland realm. He’s so regal and haughty in the movie, I’d imagine him to be King Thingol himself.